What is the unit called a talent? The usual rendering in English of the τάλαντον, an ancient Greek unit of mass = 60 mnas = 6,000 drachmas, about 25.8 kilograms, but size varied with time. The term “talent” became the name for a family of units of mass in the Near East. Parise showed how the talent was held at a region-wide common value by having it equal to different numbers of the smaller local units. GÚ‍(.UN) Sumerian (logogram) x GÚ.UN....ina danniti = x talents by the heavy talent. x GÚ.UN ..... ina qalissi = x talents by the light talent. It is highly probable that ca. 30 kg defines the optimum weight workload for most humans. Obviously, an elaborate controlled experiment could be devised to determine the veracity of this assertion. Based on my years of experience as a farm boy and a little experiment which I recently undertook, I will allow myself the following assertion. If a load is to be carried over a distance involving a minute or more carrying time, and this task is to be repeated throughout the working day, an average load of ca. 30 kg will result in the maximum accomplishment of work, i.e., the maximum utilization of the human power source. Ancient Mesopotamian weight metrology: Methods, problems and perspectives. Marvin. A. Powell, jr and Ronald H. Sack, editors. Studies in Honor of Tom B. Jones. Kevelaer: Verlag Butzon & Bercker; Neukirchen-Vluyn: Neukirchener Verlag, 1979. 3,000 shekels, approximately 49 kilograms. = 3,600 shekels, approximately 30 kilograms. There was also a heavy talent, twice the weight of the light. In ancient Greece, a unit of mass equal to the quantity of gold whose value was equal to that of an ox, about 8.4 grams. The Homeric Talent, Its Origin, Value, and Affinities. The Journal of Hellenic Studies, vol. 8 (1887), pages 133-158. In Great Britain, second half of the 19th century, another name for a proposed unit of mass also called the foot-weight. The system of which it was a part was proposed by Lowis D&apos;Aguilar Jackson in a series of articles and books, as an English alternative to the French metric system he deplored. His system was based on the foot, with (usually) decimal multiples and subdivisions, but often preserving old names (a mile, for example, would be 5000 feet). Weight was based on the mass of a cubic foot of water. 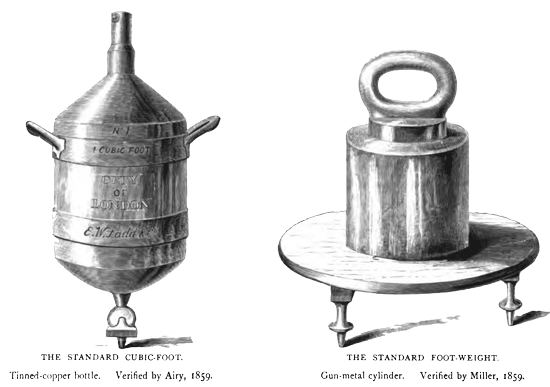 The commercial foot-weight, or talent, being the weight of an English cubic foot of distilled water at 62° Fahr. in air, by standard constructed and legalised in 1859 for Great Britain. London: Crosby Lockwood and Co., 1882. 1. Louis [sic] D'A. Jackson. Our measures and our standards. Journal of Science, vol 21 (old series), page 741 (December, 1884). John George Swindell and George Rowdon Burnell. Rudimentary Treatise on Wells and Well-Sinking. Last revised: 25 May 2014.